Ricky Montez, 33, of Palm Beach Gardens, Fla., takes a water break while running on the Blue Heron Bridge in Riviera Beach, Fla., on Thursday. Montez does hill work on the bridge training for the Chicago Marathon, which is Oct. 9. Ricky Montez, 33, of Palm Beach Gardens, Fla., runs on the Blue Heron Bridge in Riviera Beach, Fla., while training for the Chicago Marathon. "I believe I have been forgiven for all of my sins," said Montez, whose tattoo was started in jail and finished when he got sober. Ricky Montez, 33, of Palm Beach Gardens, Fla., trains for the Chicago Marathon. Ricky Montez, 33, a Schererville native and Lake Central High School grad, got his life together after completing rehab four years ago. Ricky Montez, 33, of Palm Beach Gardens, Fla., runs on the Blue Heron Bridge in Riviera Beach, Fla., while training for the Chicago Marathon. Ricky Montez with Daisy in a Florida swimming pool. Montez, who grew up in Schererville and was hooked on heroin for 10 years after high school, is now living a clean, sober life in Florida. He has been clean since March 2007. 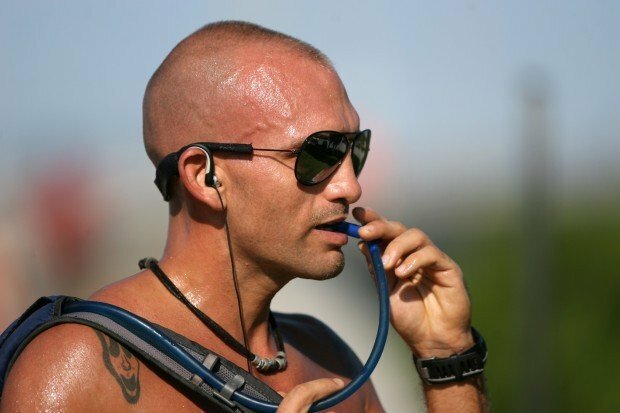 Ricky Montez counts snorkeling among his hobbies now after battling a heroin addiction for 10 years. The Schererville-raised Montez was featured on A&E's "Intervention," entered rehabilitation and has been sober for more than four years. Ricky Montez, 33, tries his hand at amateur night at a Florida comedy club. Montez, raised in Schererville, was addicted to heroin for 10 years but has been clean and sober since March 2007. Ricky Montez is shown high on drugs in an episode of the A&E reality show "Intervention." Montez, raised in Schererville, has been sober since March 2007. Chicago police kicked in the door of a Chinatown restaurant bathroom and found a nearly dead Ricky Montez on the floor. The Schererville-raised Montez, who once walked the halls of Lake Central High School in a letterman jacket stitched with patches lauding his athletic achievements, had overdosed. He had fallen so deep in the hole of addiction that he couldn't wait for the trip home to Northwest Indiana to get high after scoring dope. "The very next day, I was back there looking for it," he said. Heroin almost killed him eight times. "If I wasn't on the verge of death, it wasn't a good high for me," he said. "I wanted to get so high I was almost dead. The things that I would do to get that high, there was no stopping me. It's brought me down some terrible roads." A tattoo across his back shows the turn his life has taken. 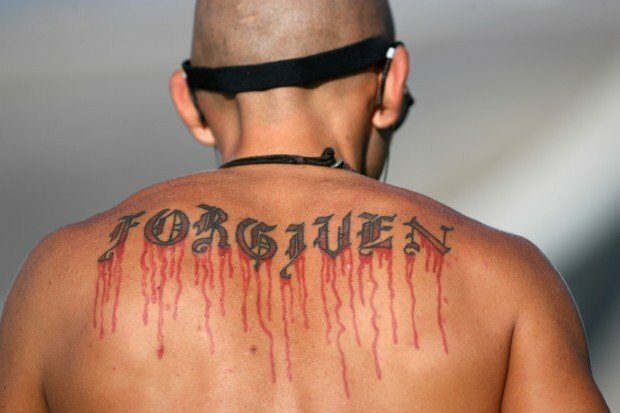 Old English letters dripping with bleeding red ink spell "FORGIVEN." The piece was started while he sat in Lake County Jail eight years ago. "But I got it finished up when I first got sober," Montez said. "The reason I got it is because I am a believer. I have an amazing relationship with Jesus Christ. And although sometimes I regret some of my tattoos, I absolutely love this one." His story of addiction played out on a national reality show that offered him a chance at rehab. He took it. Montez, 33, hopes that by sharing his story, people will think twice before getting high and putting themselves, their family and their friends through hell. Yearbook photos show Montez in his running gear and hoisting a trophy with the Lake Central High School cross country team. He was fast, and he was smart. "I was a straight-A student, had a lot of things going for me, and I chose to go down that path," Montez said. Not long after high school, he got high on heroin for the first time, an addiction he fueled until he was 29. "I started in probably 1997, right out of high school," he said. "The majority of people that touch it get addicted to it." Montez traveled to Chicago's West Side to score heroin. "The dope out there, they started cutting it with fentanyl (a narcotic painkiller)," he said. "I had a lot of friends as well that were OD'ing. Kids were dropping dead left and right." Some addicts would ride commuter trains to the South Side of Chicago, buy drugs and take the train back to Indiana, he said. The deaths -- even the prospect of his own -- didn't stop him. "It controls you," he said. "You're addicted to the lifestyle. It's so highly addictive, and kids are ignorant to it, especially in suburban areas." Every step of his day, he was figuring out how to get money in his hands for his next high. Every purse was a temptation. Family and friends turned to the reality show "Intervention," which airs on A&E, for help. On the show, addicts are told they are being filmed for a documentary about addiction. In fact, they are the target of an intervention, in which friends and family confront the addict about his behavior. At the end of the show, the addict is offered a chance at rehabilitation. The episode showed Montez getting high and being destructive and violent. At the end, he agreed to go to rehab in Florida. He was kicked out after two months for disruptive behavior and later moved into a sober-living facility. "I finally made it a choice," he said. "Working the steps, finding out the underlying reason." His experience with drugs -- and freeing himself from the grip of addiction -- molded the man he is today. "Now I live my life on full tilt, the other way," he said. March 17 marked four years since he's been clean and sober. Moving away helped, he said. He lives in Florida, among palm trees and sun. He serves tables at a waterside casual restaurant that's popular with the live-music crowd. Montez, who is going to school for sports medicine, is training to run the Chicago Marathon in October. VALPARAISO | A week ago, Valparaiso police were called to a discount store for a 26-year-old woman acting strangely in the parking lot. After a bizarre exchange, officers searched her and found a plastic bag with heroin, a number of loose prescription pills and a bag containing six syringes and a burnt metal spoon.